Most people who grew up before the age of the selfie will have some memory of family group portraits taken using the self-timer function on somebody’s camera. Most film cameras had a prominent lever or an obvious button somewhere, to trigger a clockwork mechanism or an electronic delay. The camera would be positioned on a chair or table, while the group arranged itself, leaving space for the photographer whose job it was to frame the image, set the timer, and run to take up position and say “cheese”. Timers always took longer than you imagined, and you never quite knew when they would stop. The photographer, trying to avoid becoming a blur in the photograph, would arrive in the group flustered, yet by the time the shutter clicked, everyone’s smile would have been held a little bit too long. This photograph was taken with an Ondu pinhole camera on the beach at Low Newton in Northumberland. There is no timer on the camera, but the twelve second exposure gave me time to open the shutter, run to join my three friends, hold still for five or six seconds, then run back to close the shutter again. I like the effect long exposures create of being there, but not there; this is a record not of a moment, but of time passing, visibly. 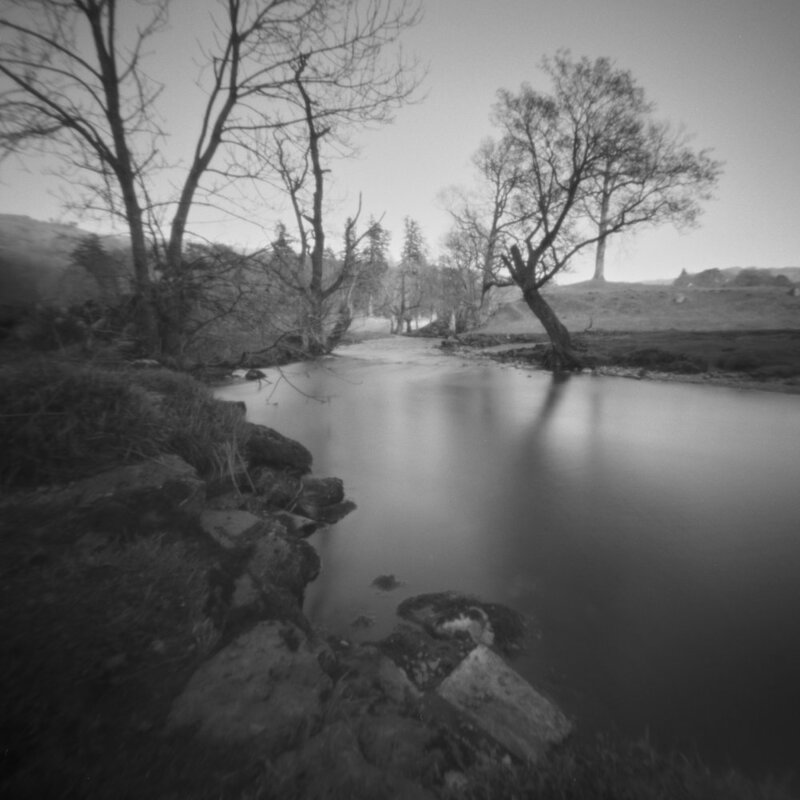 These four images were taken with an Ondu pinhole camera in the Spring of 2016, in the area near to Pelter Bridge on the River Rothay at Rydal, between the outflow from Rydal Water and Under Loughrigg. I have been photographing this small area throughout the year as part of a project responding to the effects of Storm Desmond, which flooded large parts of the Lake District and Northern Britain over the weekend of December 4th-6th, 2015. I've been using several different types of camera--film and digital--in an attempt to capture the physical effects of the storm, but also the usual tranquility of the river and surrounding landscape. 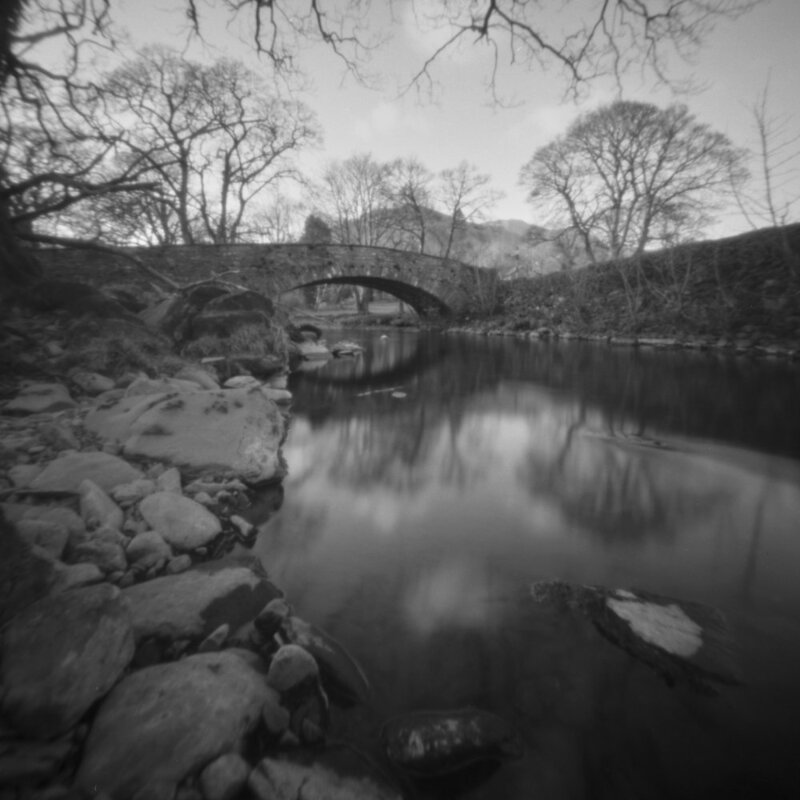 I quite like the distortion in these pinhole images.